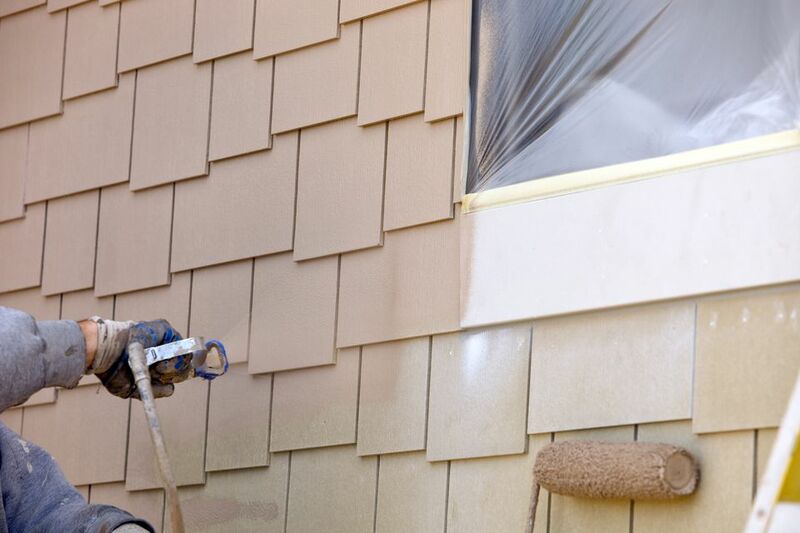 Whether you use a brush, roller, or sprayer, there is no easy way to paint the exterior of your house. When certain factors are right, painting your house with a sprayer will be both easier and faster than with a roller or brush. Fast: Once prep is finished, you are suited up, and the sprayer is primed, spraying goes quickly. Coverage: Paint-spraying your house is effective when your house has surfaces that are not perfectly flat or has obstacles such as wires, pipes, eaves, slats, clapboard, etc. Prep Work: The prep work is long and arduous. Every single part of your house within spraying range that will not be painted must be masked. Post-Painting Clean Up: Even with proper masking and drop-clothing, you will end up with lots of paint everywhere. It takes about 30 minutes to clean out your paint sprayer properly. Airless Paint Sprayer: You need the type of airless paint sprayer that draws directly from the can, not the type that requires you to fill up an attached cup. Example of the former: HomeRight Power-Flow. Example of the latter: Graco TrueCoat Pro Cordless. Paint: This is your choice, but make certain that it is exterior paint. You can save money and make the job go faster if you purchase 5-gallon cans of paint. Clean Water Bucket: A clean bucket that will stay clean throughout the painting process. Waste Bucket: A bucket that will receive drained paint and other dregs of the paint-spraying process. Do not expect to be able to clean this bucket afterward. Siphon in Paint: The siphon is the large tube with a wire screen at the end. Place directly into the paint can with the screened-end at the bottom. Drain in Waste: Put the drain tube into the waste bucket. Plug in Power: Plugin sprayer to the electric outlet. Place the waste bucket and paint can side-by-side. This is also a good time to put on your cover-alls. Switch to Prime: You'll likely have a single switch that toggles between "paint" and "prime" modes. Switch it to "prime." Power On: Switch on the paint sprayer. Squeeze Sprayer Gun: Hold the sprayer trigger. The pump will run for about 30 seconds. Paint will begin pumping out of the paint can, through the sprayer machine, and out drain tube into the waste bucket. Your paint is on a one-way path. Quickly switch the drain tube, placing it into the paint can, toward the bottom. The drain and siphon tubes may even have clips that hold them together. Now your paint is making a continuous cycle. Tip: Keep buckets side-by-side for a quick switch. Buckets are shown here farther apart to make it easier to demonstrate a relationship between the two. Shut off the machine and suit up with the rest of your protective gear. You can't wear too much protection gear when spray painting. Yes, you will look dumb, and it is uncomfortable, but it will save your eyes, skin, hair, and clothes. Full-Body Coveralls: Buy the kind with the booties attached. If not, you can buy separate shoe covers or use shoes that you don't mind ruining with paint. Goggles: Not just safety glasses, but goggles that seal all around your eyes. Respirator: Not just a paper mask, but a HEPA respirator. Spray Sock: If the coveralls don't have an attached hood, buy a spray sock. It's a simple piece of cloth with a face cut-out, much like a ski mask. Gloves: Old gloves you won't mind getting ruined or latex gloves. Warning: latex gloves will get slippery after a while. Holding the spray gun closer than 12" will result in drips. Holding the gun farther than 24" (you can probably even push this to around 30", though) will result in a fuzzy texture and uneven coverage. Using a paint sprayer on your house exterior is like a larger version of the paint brush. The rules are the same. Mentally divide your work surface into sections. Finish a section and then move onto the adjoining section. The sections are small enough that the edges stay wet as I move from section to section. Paint sprayer instruction books tell you to keep the spray gun parallel to the wall at all times. In a perfect world, you would do this. In our imperfect world, the gun will naturally angle away, especially at the end of a run. The best you can do is try for parallel, try to minimize these tilts, and try to cover over bad edges on your next run. When finished, fill the clean bucket with water. Remove the siphon tube from the paint can, put it in the clean bucket, and switch the paint machine to "Prime" or "Flush." Spray until clean water flows out. You may need to change out the water in the clean bucket about three times for this to happen.